Guam’s capital village of Hagåtña is dotted with remnants of the island’s vibrant 4,000-year history – from the ancient Chamorro Latte period to the Spanish era and periods of war and occupation. In Hagåtña, visitors can walk a path that connects 17 historical sites and brings to life the resilient and fascinating history of the Chamorro people. This path is called the Hagåtña Heritage Walking Trail. The 2.5-mile (4km) trek winds through some of Guam’s most iconic historical sites including the Dulce Nombre de Maria Cathedral-Basilica, which stands on the land that Chief Kepuha gave to Father Luis Diego de San Vitores in 1669 to build the first Roman Catholic church in Guam. 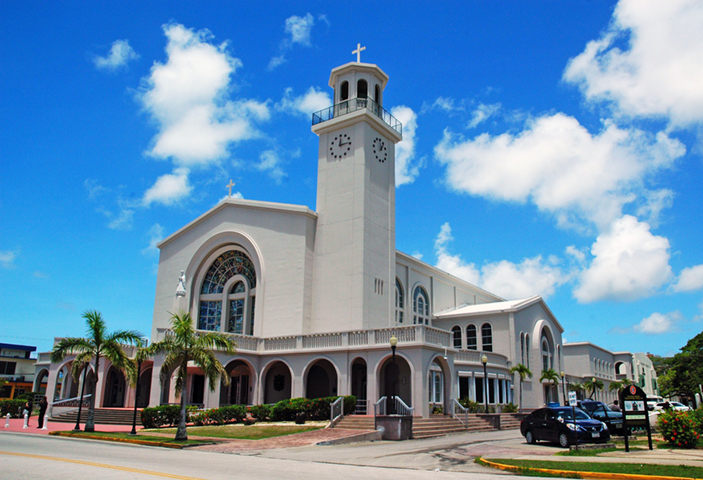 To this day, the Cathedral is the center of Guam’s Catholic community. Another iconic site on the Hagåtña Heritage Walking Trail is Plaza de España, which has served as the center of cultural, religious and government activities for centuries. In the 1660s, the Spanish colonial government chose this site as the Plaza Principál. Historic sites here include the Azotea, the last remaining structural element of the Governor’s Palace; the Almacen Arches, Guam’s signature triple arches that were once the entrance of the royal warehouse built in 1736; and the Chocolate House, the small round building that was used by both the Spanish and American administrations to host meriendas where beverages and pastries were served. Other areas on the trail include the San Antonio Bridge, one of several surviving stone bridges on the island. It was built in 1800 and spanned the Agaña River until the river was diverted in 1946. Beside the bridge is a statue of Sirena, Guam’s legendary mermaid. Latte (stone columns) are unique to Guam and the Mariana Islands and were used as foundations of ancient structures from 800 to 1700 A.D. At the Angel Santos Memorial Park, visitors will find eight latte stones that were once used as strong foundations by the ancient Chamorros to support their wood and thatch homes. These are only a few of the cultural and historical sites that are part of the Hagåtña Heritage Walking Trail. Download the brochure and walk, or combine walking and driving, to visit all 17 sites of this grand outdoor museum of Guam history.